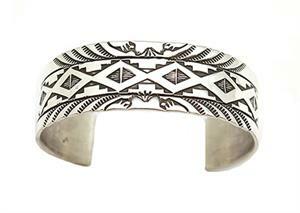 This good weight (14ga) stamped sterling silver bracelet measures approximately 3/4" wide. It is handmade by Navajo artisans Rick Enriquez. Stamping will vary.